The G9 lamp is used extensively in lighting these days. The real advantage of the G9 is the small size which can be a real benefit in decorative lighting. In the olden days the light source of chandeliers was wax candles and these were a real feature of the chandelier. This has now created a strong demand for decorative candle light bulbs but even these can be too obtrusive for modern lighting. If the beauty of a decorative light is in its design and artistic nature, then the illumination then needs to be as discrete as possible and it was through this need that the G9 was created. With traditional filament light bulbs then it was not possible to create miniature lamps but with the advancement of halogen technology technology then tiny lamps were possible as shown here. 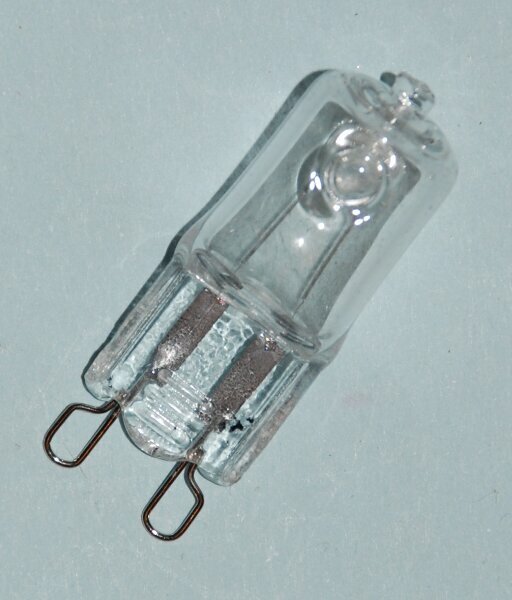 This is a G9 33w Halogen with a clear cover which is a very popular lamp. It produces a significant light output typically 350 lumens which for the miniature size has an excellent lumens to size ratio. Whilst the halogen is functionally good is does have two major drawbacks. Firstly the nature of halogen lamp technology means that the lifetime is limited to a maximum of 2000 hours. Secondly they are inefficient as 90% or the electricity is converted to heat as opposed to light which is clearly what is needed from a light bulb. The LED G9 has a number of major benefits over the Halogen G9. The main advantage is that it only uses 10% of the electricity of its predecessor. However the main issue with this technology is that they are significantly larger and this can often be problematic as often they will not fit into the lighting fixture. 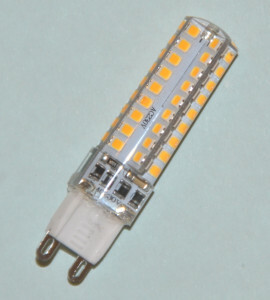 As stated previously then the main reason for a lighting manufacturer to select these miniature capsules is their compact size and this can be negated if the lamp is too large. The early LED G9s were all of quite large proportions as pictured here. Typically this lamp would be 35mm in diameter which would mean that it is prohibitively large for a number of lighting applications. 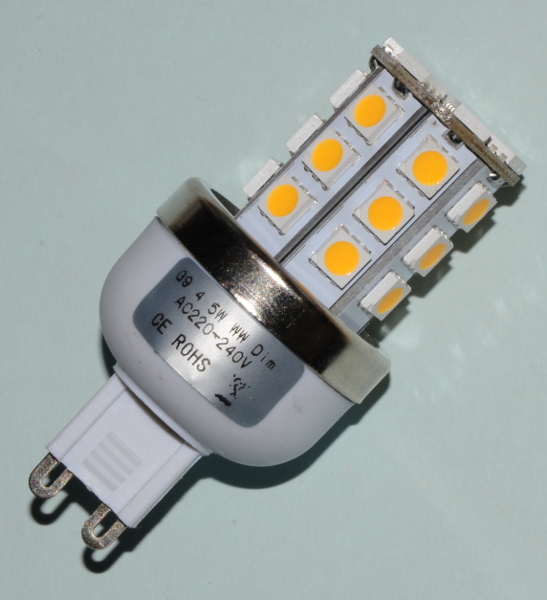 With the advancement of the LED technology then the size of the lamps has reduced significantly and now it is possible to get a 5w LED G9 which is of much smaller proportions. The one shown here is 60mm in length but just 18mm diameter. Whilst this is not as small as the halogen G9 it is now of an acceptable size for a number of decorative lighting fixtures. It is also possible to obtain LED filament versions and whilst these are quite small again then they are not inherently as reliable as the SMD LEDs. The other more recent development is to introduce dimmable technology. This was not important with the early LED G9 as they were not very bright and accordingly there was not a great necessity to dim the lamps. However with the brighter versions then the dimming capability can be very beneficial to create effective ambience in a room.